Tag Archive | "Christmas Party for Gringos;"
See a link about Ecuador charity, giving and an Ecuador Living excerpt below. Our Ecuador charity does not just give. Just giving builds dependence which is not our goal. Our aim is to help the great people of Ecuador help themselves. For Meson’s success, we thank all of you who have visited us here. The staff at Meson de las Flores asked me to send all of you their best wishes for UN MUY FELIZ ANO. Here is Meson’s staff. From left to right Meson’s staff. 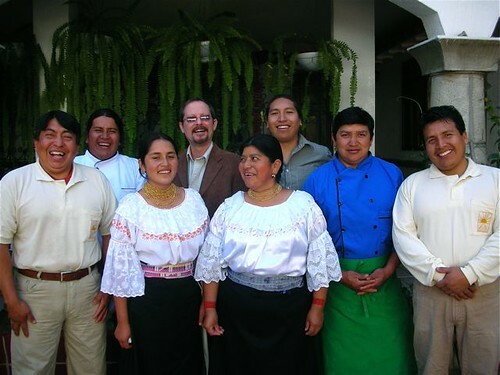 Ecuardo – maître d, Alberto – sous-chef, Consuelo – hostess, Ray – global liasion, Rosita Elena – maid, Mauricio, – night assistant and tour guide, Santiago – chef, Franklin – manager. Not present Rosita De la Torres – maid. The staff of Meson de las Flores are to be congratulated. They are remarkable people who have been willing to work hard for and to deserve their success. Here is the type of comment I continually receive about service at Meson de las Flores. Dear Gary and Merri, From Mesón de las Flores I am sending you my very best wishes for this coming year!!! I am at your hotel since Monday afternoon together with two good friends and we have really enjoyed the place, the warmth of your staff and the natural food. 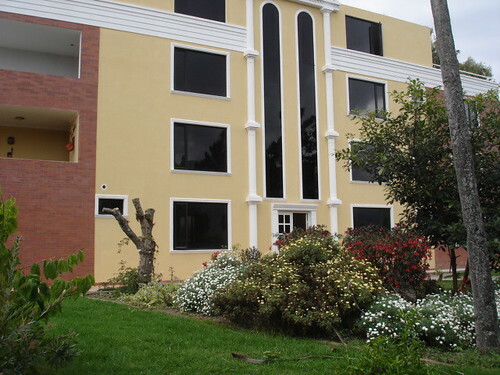 I have particularly enjoyed the chance to relax, to do some sightseeing in Cotacachi and Otavalo. 2008 was a very busy year for me, but also a very blessed time for which I am very grateful to God. I thank Him for the opportunity of having met during this year people like you who has a passion for what they do and their work benefit many people´s live. Have a wonderful 2009!! I LOVED the market in Otavalo and came home with another extra-large Ecuadorian bag loaded with rugs and wall-hangings. A very tempting place that I visited 4-times just to give you an indication of how much FUN I had there. We’ll have to see how our retail season goes and if I can break away for a couple of weeks, I’ll travel back to Ecuador for two weeks in April. 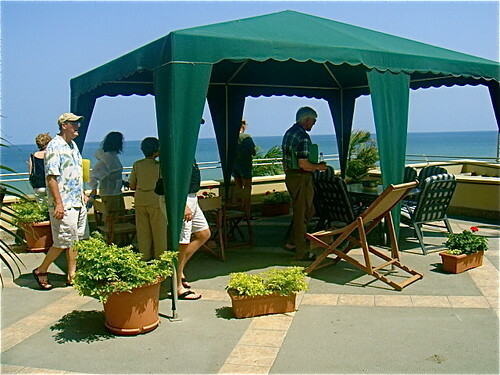 Ray is a splendid character and makes one feel that “our casa is your casa” during your stay. He has that manner that invites and excites and I feel he is a huge plus to your organization. Everyone really likes Ray and I miss him already and his lighthearted banter and genuine care. Next trip I’ll bring lots of ones and fives. Even twenties were a drag. Imagine! At home a $100.00 bill goes direct to pay one bill alone or one “small” grocery shopping without blinking an eye. Hi, Gary and Merri. Just a quick note to say thank you for the great Christmas Party for Gringos at El Meson! It was a lot of fun and we were amazed at how few of the people we actually had met. Of course we solved that by making sure we met everyone there and invited them to visit us when out our way. We wish you a very blessed Christmas and a fabulous 2009! Looking forward to seeing you soon, Love. Hi Merri, We are back from Ecuador and in a serious cold spell in Alberta. It is minus 30 C this morning but is beautifully sunny. We have a little snow so at least it feels like Christmas. I just wanted to say thanks for your guidance in planning our trip. I also wanted to let you know what a terrific job Ray did despite the fact that he was a sick as a dog. His upbeat positive attitude and willingness to help was second to none. He is a real asset to your organization. We enjoyed our stay at El Meson and found Cotacachi and the surrounding area to be both beautiful and peaceful. We are already planning our next trip to Ecuador and are dreaming about its warmer days. Best wishes for the holiday season. Ray and the staff make everyone feel like part of our family…and you are…when you stay with us at Mesons, as this guest noted. I just wanted to drop you a note and let you know how much myself and all of our “extended family” enjoyed the course that you, Gary, and all of your competent staff put on earlier this month. I am really just getting my feet back on the ground and I think that we are finally there. Gary was awesome as we expected and gave me as really a beginning investor many insights and new ideas to think about. I am speaking for myself and several others. You showed me that you are an expert planner and really went out of your way to accommodate us especially when we had people coming in at different times. Last and not least was Ray who also handled so much on the fly and did it well. Ray really helped with the leaving process. We really enjoyed your hotel and the hospitality. It was memorable. Thanks so much and we hope to keep in touch and continue with Gary’s newsletters! Merry Christmas and Happy Holidays. Merri, We have arrived at Palmazul and it is very nice. I would like to tell you that Tina and I had a wonderful time at Cotacachi. The staff and service at El Meson could not have been better. I must tell you that Ray was an excellent host and was attentive to every detail of our stay. All of the other guests love Ray. I will report back to you after our trip in Palmazul. Best wishes. Hi Merri: Back home after that long flight and am already ready to return to Cotacachi. Gary’s e mail this morning about the essential oils and other things to reduce stress. He left out the most important thing…..Going to Cotacachi, El Meson, meeting new friends, seeing old friends, and seeing all the wonderful smiles of your staff, and the people of Ecuador. When I go to Ecuador, after the first day, I take no medicine, eat healthy food, get lots of exercise, and just feel wonderful. Since I have been home..ort on my travels home, I have had a who knows what hamburger, bag of fritos, diet cokes, processed cheese and other just total crap, and I bet I have gained back those four pounds I lost in Cotacachi…in just two days. Guest really feel healthier and enjoy our philosophy of health at the hotel. Dear Merri and Gary, How wonderful an experience we had with you…and how much respect we have for you both. Thank you for the extraordinary services you are offering in these times to so many. It is rare that we feel as aligned with people as we do with you on so many fronts at once – investments, political opinions, commitment to the indigenous, ‘being healthy,’ commitment to organics/biodynamics and a religion of being kind. Wow. With Appreciation. My Dearest Merri and Gary, I cannot thank you both enough for your wonderful hospitality. I just want you to know that everything I read about Ecuador from your news letters and emails was exactly the way you described it and better………….. The day we were all returning to Quito to go our different ways at the end of the tour, I was overwhelmed with tears because you both had been so wonderful and I didn’t want it to end. I was already missing you and the wonderful experience I had had during your Ecuador Tour Adventure……..You both are very special and I am honored to be a part of your Group. I fell in Love while I was there……………..I fell in Love. Everywhere we went I felt as though I was surrounded by smiling faces. Just walking out of the Hotel in Cotacache, the Native Indians of the area were dressed in their Native costume, except it wasn’t a costume, it was their way of life……….Immaculate, clean clothes, beautifully embroidered blouses with wonderful long wool skirts, colorful sashes around their waists, carrying small children wrapped in beautiful fabric on their backs. I was in awe………. I was feeling as though I was in a time machine that was set for the mid 1850’s. I had indeed traveled back in time and landed in Ecuador…………….The air was clean, the water was fresh, the food was healthy and delicious…………..I kept thinking, Where am I? Is it possible? Am I dreaming? Is it real? After being there for a couple of days, and easing into the relaxed, tranquil, lifestyle. I began to notice the little nuisances of the Indigenous people I was surrounded by. Every morning, wherever I went, I was always greeted with Buenos Dias ( good morning). It was so peasant and so comfortable so nice. I forgot about where I had come from, and my only concern was finding out everything I could about this beautiful Gentle Country of Beautiful gentle people. Everyday was a unique Visual Experience for me. There were many times I was overwhelmed with emotions of humility and feelings of being honored and grateful to have had the opportunity to experience this unique Gift in those present moments. A Gift that you, Gary and Marri, have made available to a select few. You and Ecuador have changed my life and my thinking. Thank you, I am so grateful. We invite you to join us in Ecuador this year. Our January courses are almost full but we have plenty space in February and beyond. Better still join us all year in Ecuador! See our entire schedule of 27 courses, tours, mingos and expeditions we’ll conduct in 2009 and how to attend them FREE.